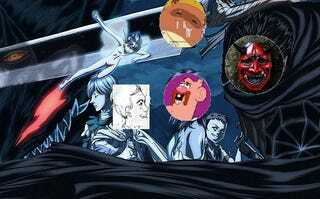 We will be covering Berserk!! The Bandof the Haken reunites again and with new members! Last year in an united effort, Jonuiuc and I covered the anime of Berserk as it aired by making different opinions and formats about the chapters and series in General. Now, we will do the same; but we won´t be alone since Gugsy and Requiem will join us in order to bring new perspectives to this new Season!